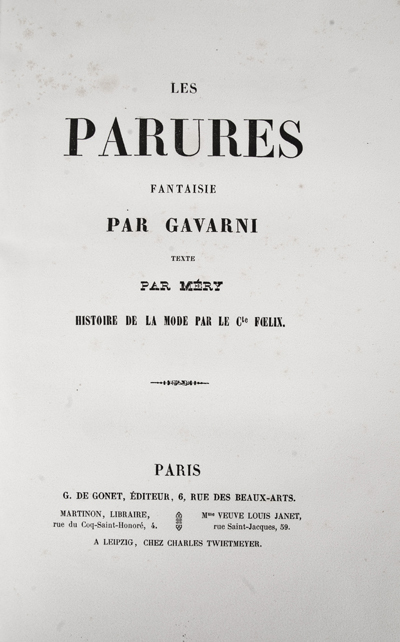 In 1844, Joseph Méry published Les Parures (The Ornaments) and Les Joyaux (The Jewels), each a "Fantasie par Gavarni," the two volumes graced with a total of thirty-two engravings by Paul Gavarni (1804-1866), the great French caricaturist and artist. 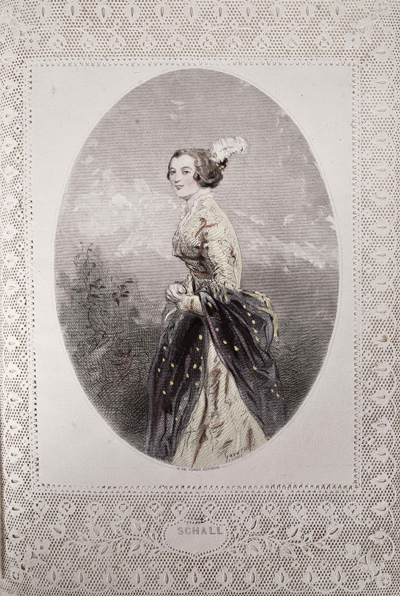 A special and now quite rare issue of the volumes was simultaneously published, the steel engravings printed and delicately colored on paper with borders cut to various lace patterns, or decoupes en dentelles (cut lace), commonly known as doilies. 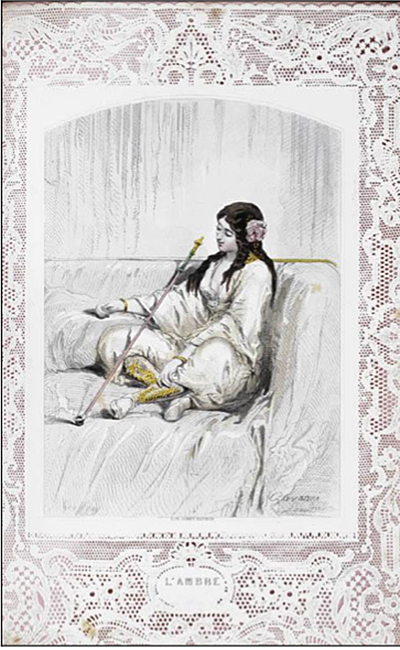 Gordon Ray, author of The Art of the French Illustrated Book 1700 To 1914, only had a copy of the ordinary issue, but noted that the special edition was far more appealing, and believed that by presenting the plates in this stylish manner "Gavarni's designs become fashion plates of the first order." Paul Gavarni was the nom d'art of Sulpice Guillaume Chevalier. His rise to fame coincided with that of Charles Philipon (1800-1861), the Parisian publisher whose satirical newspapers featured sharp lithographed caricatures with pointed captions (written by Philipon) that often became the subject of the French authorities attention; politics in France at this time was often chaotic. 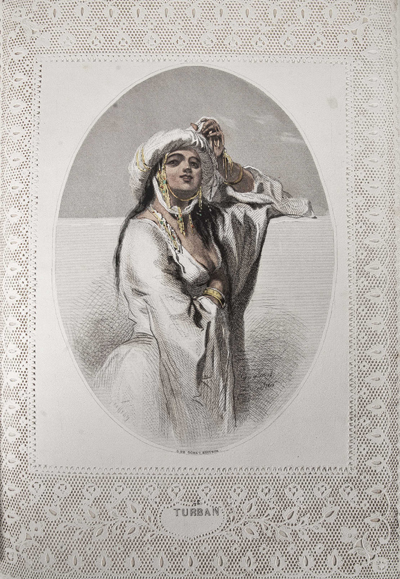 The plates were engraved by Charles Michel Geoffroy (1819-1882) based upon Gavarni's designs. 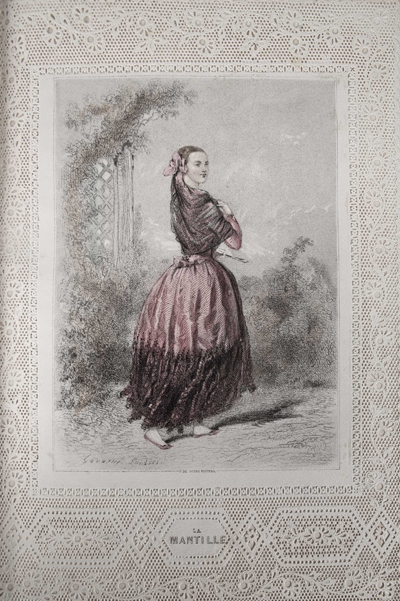 Gavarni's work for Philipon humorously essayed the most striking characteristics, foibles and vices of the various classes of French society, in the same vein as Henry Monnier, who also worked for Philipon. Indeed, Philipon discovered and fostered the careers of many of Paris's finest young artists. Though issued separately, the two books are considered a set but as such are scarce, particularly in this, the special issue. "La reunion des deux ouvrages avec les gravures marges de dentelles est assez rare rencontrer" (Carteret). A beautiful set of the special issue of Les Parures and Les Joyaux has recently come into the marketplace. [GAVARNI]. MÉRY, Joseph. Les parures. Fantaisie par Gavarni. Texte par Méry. Histoire de la mode par le Cte. Foelix. (Perles et Parures). Paris: G. De Gonet, n.d. . Quarto. , 300pp. Frontispiece and fifteen steel engraved hors texte plates by Geoffroy after Gavarni, the whole finished by hand in colors, and the plates themselves printed on doilies tipped onto pink guards, the pink visible throughout the elaborately full percaline, elaborately gilt and colored with designs on both covers and spine. Publisher’s original full percaline. All edges gilt. [GAVARNI]. MÉRY, Joseph. Les joyaux. Fantaisie par Gavarni. Texte par Méry. Minéralogie des dames par Cte. Foelix. (Perles et Parues.) Paris: G. De Gonet, n.d. . , 316pp. Frontispiece and 16 steel-engraved hors texte plates by Geoffroy after Gavarni, each finished by hand in colors, and the plates printed on doilies in the same format as the above volume. Publisher’s original full percaline. All edges gilt. Images courtesy of Ars Libri Ltd, currently offering these volumes, with our thanks. Gavarni's Paris Mornings and Mailbox. Deceit They Name Is Woman, Thy Name Is Delilah! This is a good one. Thank you so much for sharing.